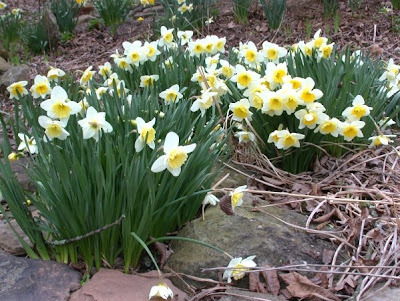 Proof that Spring has Sprung! This morning I walked around the yard and snapped a few photos for our Western relatives who may be still snowed in these days. I know Brian and Janice in Idaho had four feet of snow in their yard. 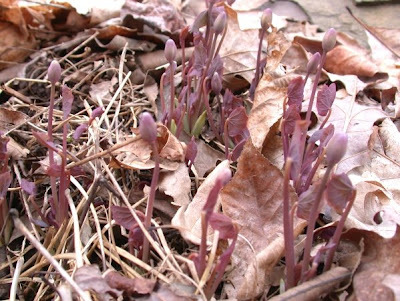 The twinleaf above is sprouting. 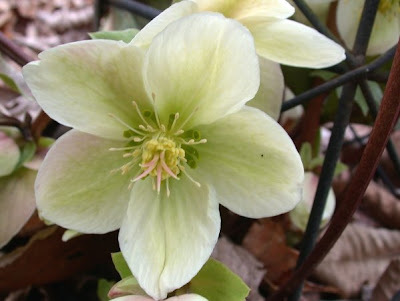 The hellebores below are in full bloom. 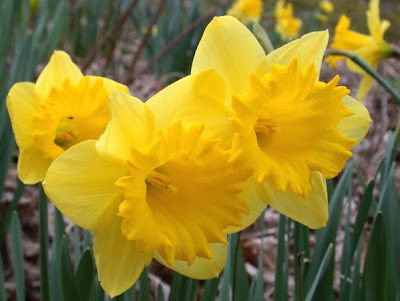 You have to love the daffodils! 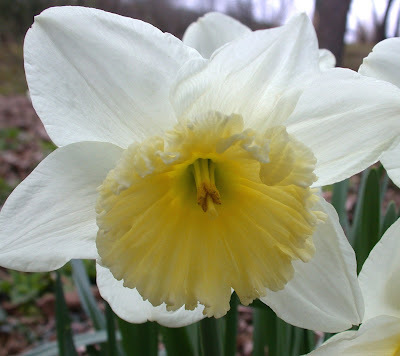 The only problem is that do not bloom long enough. 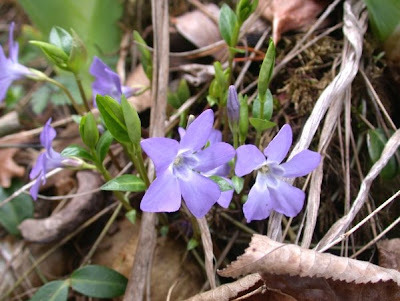 The myrtle (periwinkle) is out showing its fantasic blue coloration. 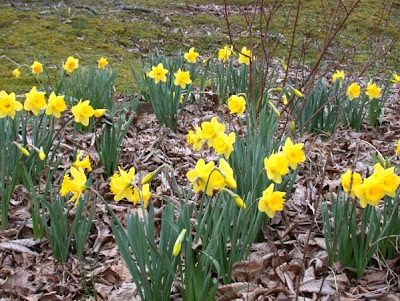 Tomorrow I shall post the positive proof of spring in West Virginia. Well, if you have kept up with the Shepherdstown, WV eagles (http://www.fws.gov/nctc/cam/eaglecam.htm), you know that the three eggs have hatched. The young eaglets are doing well. Check out this clip supplied by Steve Chase of the NCTC Eagle cam. Well, we had a great meal on Sunday. Judy outdid herself. We had friends and family in for our Easter meal. Gloria and Gink Summers, Diana Frank, Sarah, Jeff, and SAMMY joined us for the ham and turkey lunch. 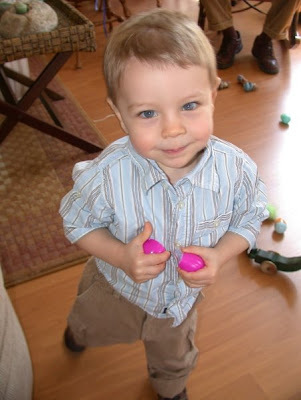 After lunch, it was Sammy's job to find the Easter eggs. 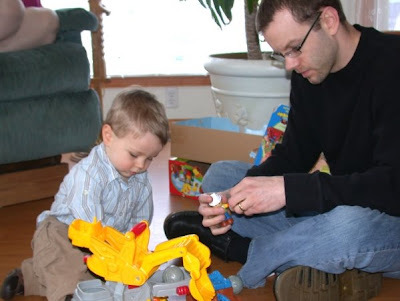 Seems as if technology has taken over the Easter bunny who now lays plastic eggs these days! 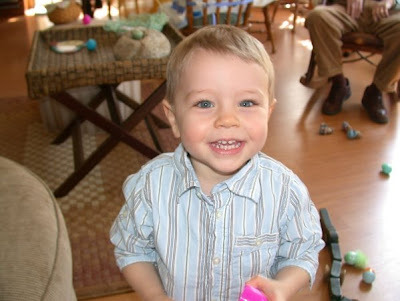 One of Sammy's favorite TV shows is Blue's Clues. 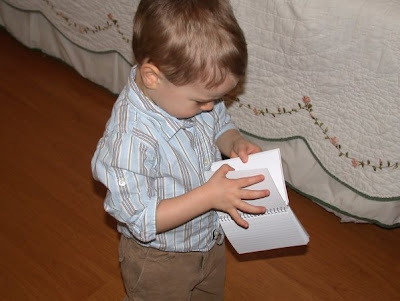 In this TV adventure, there are always three clues (marked by a blue paw print) and a fellow always have to record the clues in the notebook. 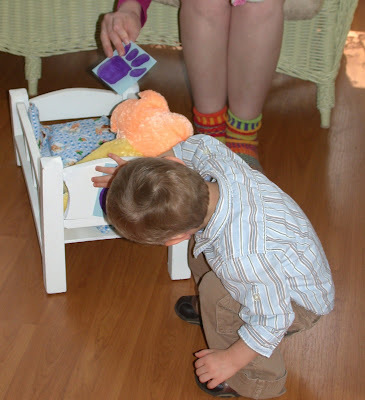 Sammy looked for clues so he could find his Easter basket. 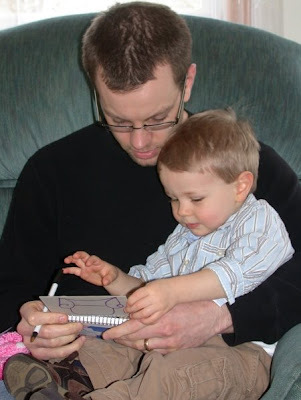 Dad Jeff and Sam are now recording some of the clues found. It is always important to have your notebook close by. Another clue! Must have something to do with a bed. Sam, indeed, found his basket and present on Grandma's and Grandpa's bed. It was a Little People Crane. Well, the first of the week was chilly, but Sam and crew decided that the beach was the place to be! 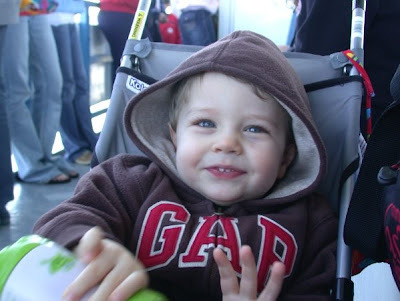 Notice Sam's COOL sunglasses! 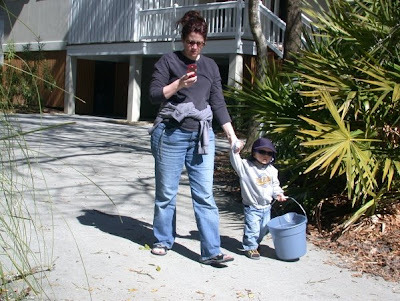 Mom Sarah is busy trying to telecommunicate and Sam is busy with his "treasure bucket". 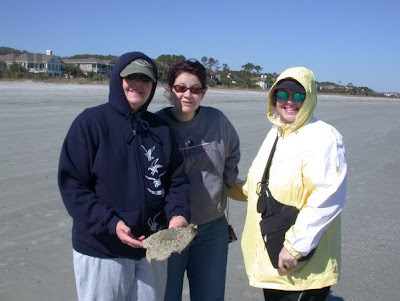 Below are the three women of our abode, Judy, Sarah, and Shirley, and they are collecting sea fauna while trying to keep warm. 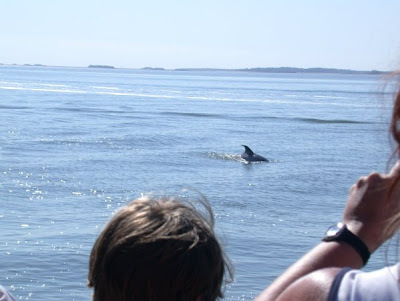 It is a great thing to see kids have their ocean experiences. 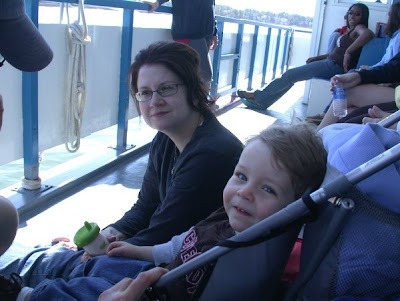 Sam was not really frightened with the waves and he seemed to be mesmerized with the ebbing of the waves. OK! Enough of the mesmerizing experience! It was time to get into some serious digging. 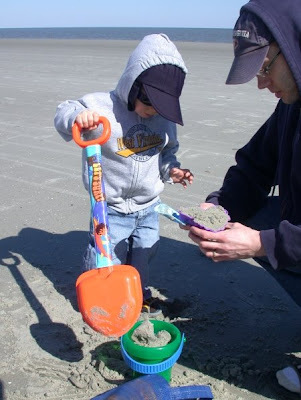 Dad Jeff is teaching the subtleties of making sand castles- put the wet sand into bucket, dump bucket - you all know the drill. 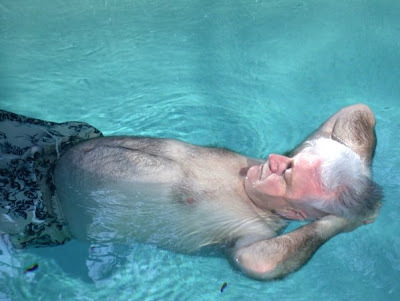 Heck, Grandpa had enough of the beach. 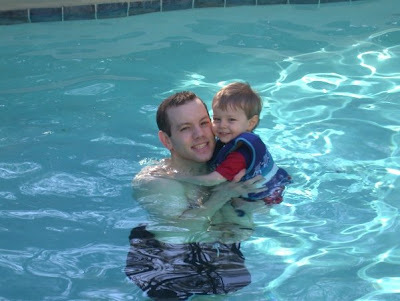 As you see from the photo below, I am as happy as a manatee living by a nuclear power plant when I am in a heated pool. 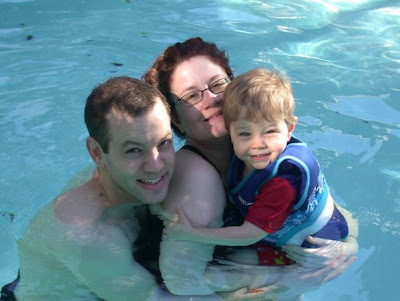 Why would anyone go to the cold beach when one can float in 90 degree pool water? 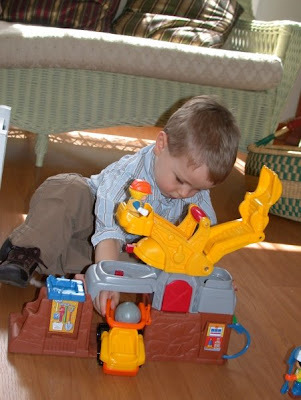 While Grandpa is napping, the other family members get into the act. Hard to nap when people are splashing and having merriment next to you! 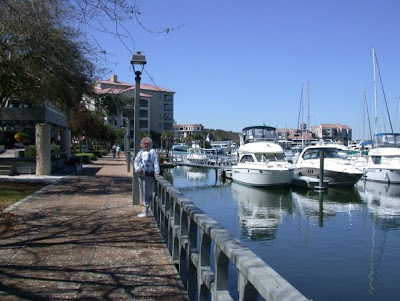 Judy and I had to check out the marina across from Palmetto Dunes. Once again there were many impressive sea-going vessels and many shops to enjoy. 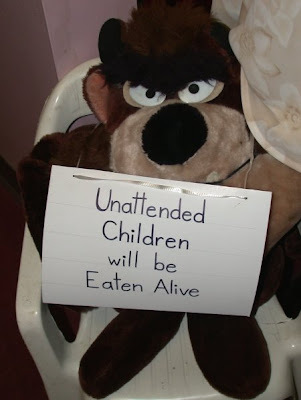 Judy loved the sign in one craft shop that said, "Unattended children will immediately be given an expresso and a puppy!" 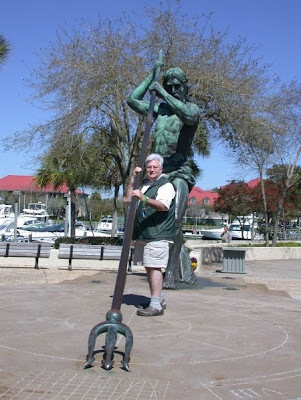 I had to impress my good wife with helping King Neptune steady his trident. This statue is a really fine sundial. Only problem- twas Eastern Standard Time! 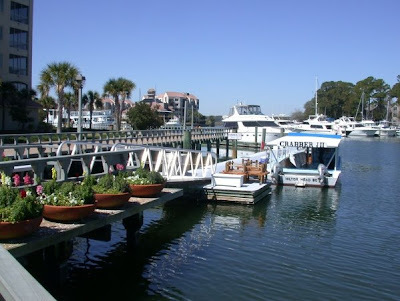 I would have enjoyed going on this tour where one goes crabbing and you get to fix your catch. 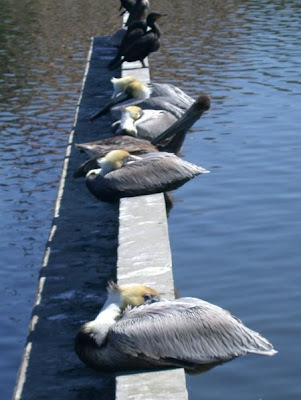 It was a lazy day for this group of Brown Pelicans and cormorants. 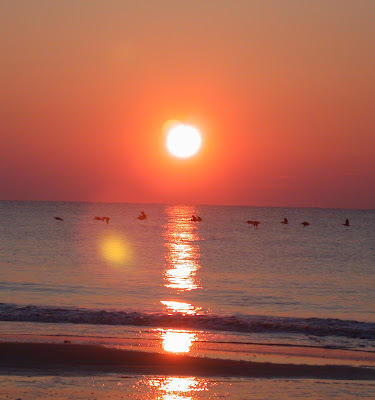 Let me leave our Hilton Head adventure with this photo of pelicans crossing the sunrise. It does not get any better than this! 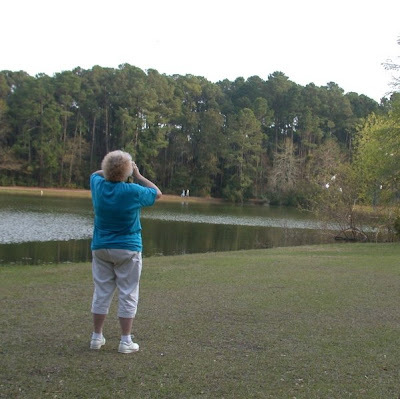 We visited the Forest Preserve in Sea Pines Plantation - the reserve encompasses 605 acres and features nature trails, lakes and a pavilion located on Fish Island. 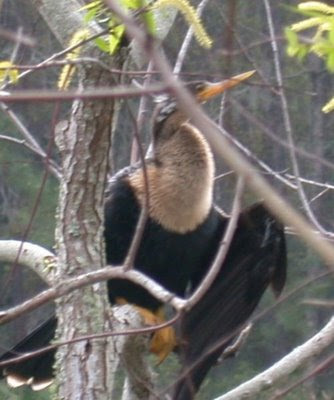 It is home to about 350 species of birds. 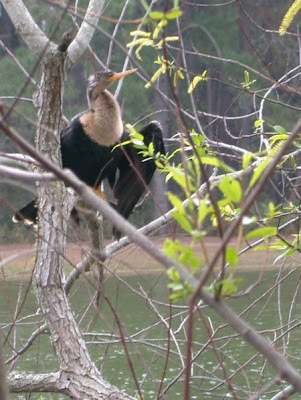 This Anhinga below was really unconcerned about our presence. 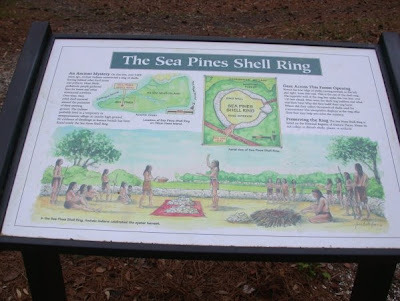 An ancient Shell Ring can be seen near the east entrance to the Sea Pines Forest Reserve. The ring, one of only 20 in existence, is 150 feet (46 m) in diameter and is believed to be over 4,000 years old. 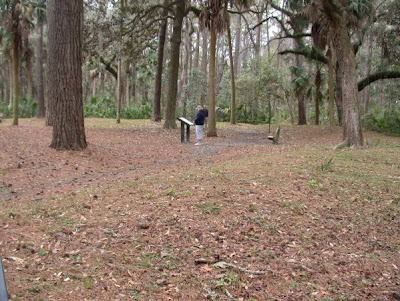 Archeologists believe that the ring was a refuse heap, created by Native Americans that lived in the interior of the ring, which was kept clear and used as a common area. 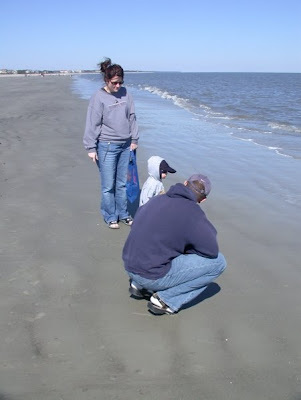 Two other Shell Rings on Hilton Head were destroyed when the shells were removed and used to make tabby for roads and buildings. 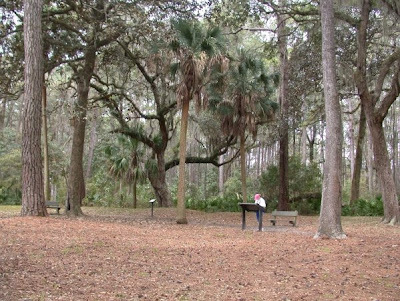 The Shell Ring is listed in the National Register of Historic Places and is protected by law. The Indian Shell Ring in the Forest Preserve was built at the time of the Great Pyramids of Egypt- 4,000 years ago. A population of white ibis were settling down in the tree near a pond. 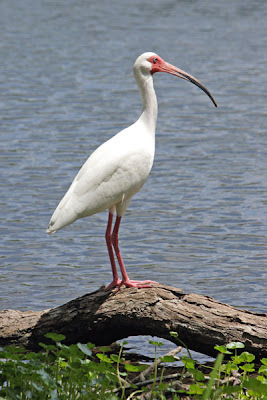 This ibis feeds by probing with its long, downcurved beak. Its diet consists of various fish, frogs and other water creatures, as well as insects. 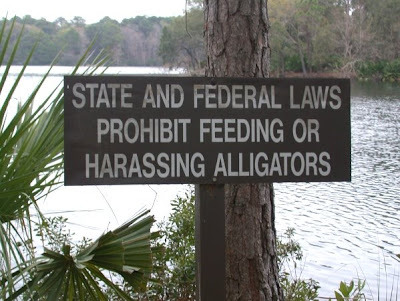 Good thing we did not happen to have a couple of raw chickens with us! 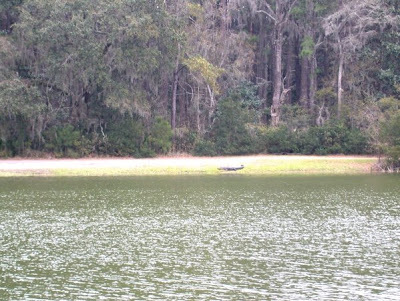 This alligator was sunny itself on the shore across from one of the ponds on the Reserve. I know! It looks like a log on the bank. A little bit after I snapped the photo, this "log" entered the water and swam off quickly! 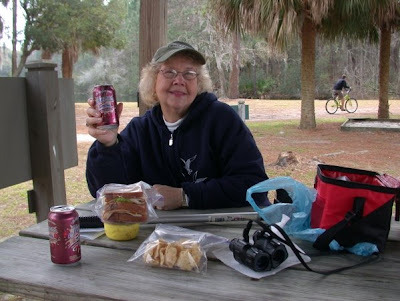 Speaking of feeding the critters - Judy is enjoying a gourmet meal of sandwiches and chips. 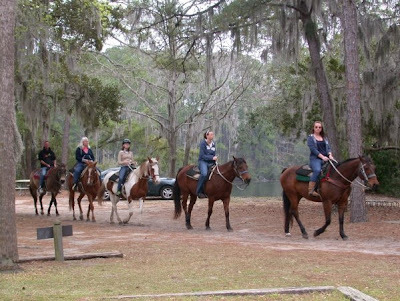 A string of equestrians came by our picnic table for a visit. We Appalachians always want to invite folks for lunch, but we did not have enough oats for the 18 horses that passed. 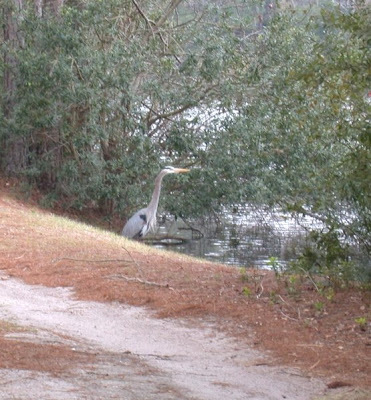 This Great Blue Heron was busy fishing for his supper. 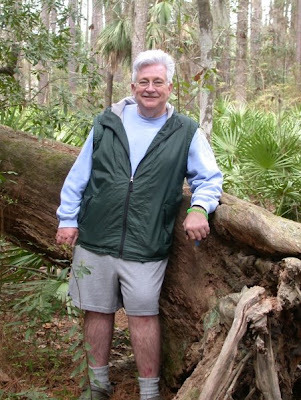 Was a nice visit to one of the special nature areas on Hilton Head. The photo above shows all of the West Virginia crew preparing to go and locate dolphins. Sammy and Mom Sarah were still at a little under the weather and not feeling super. Before we left the dock, several kayakers were heading out into the water. 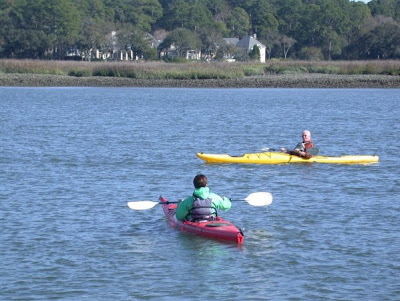 Later in the week, Sarah and Jeff were able to go kayaking. What a wonderful place for a location for a hammock! 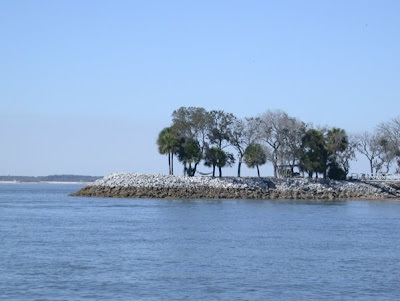 It is located between the two trees at the tip of this peninsula. 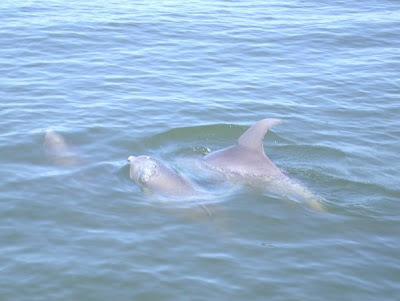 A mother dolphin and her two little ones soon appeared beside our boat. This sailboat guided by our dolphin craft. 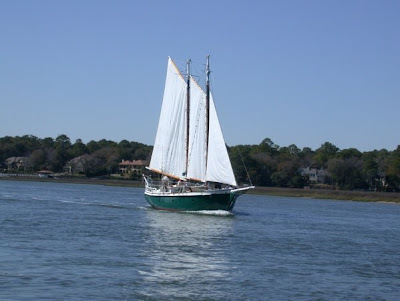 I can not see a sailboat anymore without thinking of our friend Dan (OK- and Judy!). As we were watching dolphins, Dan and Judy were sailing off the coast of Tortolla in the Virgin Islands. 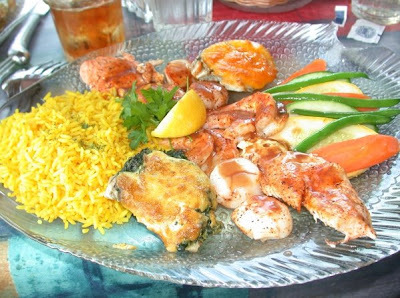 All this dolphin watching really made us hungry. 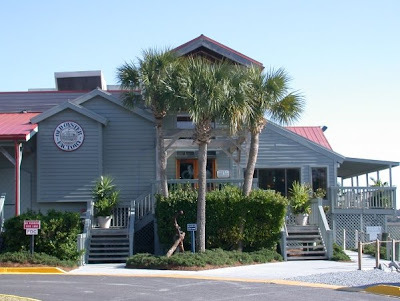 We ate at a neat seafood restaurant called The Oyster Factory. 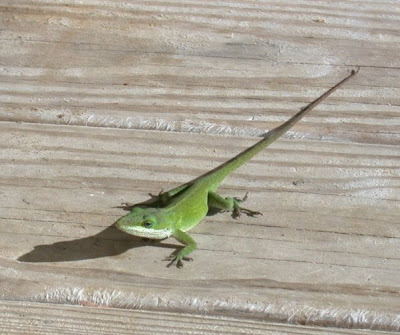 A good sign - an anole welcoming us to the restaurant! What can I say? The food was wonderful! 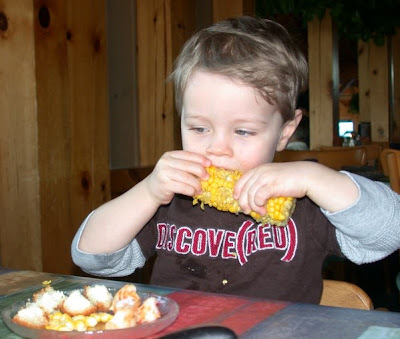 Sammy was still not feeling well, but he managed to tackle the corn on the cob!